The issue of upbringing is particularly of interest in regard to Charles, the best-documented of the couple's children, who held significant posts in both France and Ecuador. Ultimately, Ecuador was his home and most Demarquets found in South America today seem to be his descendants. At some point, very probably in Ecuador while he was still in his twenties, he married Eloisa Bustamante. They had four children: Edouardo, who married Carmen (Beatriz) Morla and had children, Dolores who married Cornelio Laso Bucheli, Carmen, who married her first cousin Leoncio Fernandez-Salvador; and Eloisa, who married Miguel Robalino and had one daughter (Hortensia, who married José Ignacio Calisto y Guarderas) Boletin de la Sociedad Equatoriana de Estudios Historicos Americanos March-April 1920 IV:302. He had no doubt been back in Quito for some time when he became, in 1886, the canton's “Political Chief” (Jefe Politico, an appointed cantonal leader) Quito:Colección de leyes y ordenanzas.. ...It took almost thirty years for Sucre's remains to finally appear, after long and persistent searching, in which both the government of Venezuela and the Venezuelan relatives of the marshal took an interest. Rosario Rivadeneira, quiteña and of advanced age, confided one day in 1891 to Carlos Demarquet, political chief of Quito, the secret that the corpse was in the Carmen Bajo. Demarquet did research in the church of San Francisco, under the irritating pressure of a Venezuelan priest with the marshal's family name. Perhaps he did not take Mrs Rivadeneira's confidence seriously, or he did not want the Venezuelan cleric to know; and the information was forgotten. It seems in fact he was irritated by Father Sucre, though that seems a strange reason to have abandoned his inquiry. In April 1900, the woman repeated her revelation, this time to doctor Alejandro S. Melo and to César Portilla. How did she know? By a confidence of the steward of the Marquesa's El Deán estate. The secret depositories rushed to inform the President, Eloy Alfaro, an eminent Bolivarist. Three days later, on April 24, the public could watch the discovery, exposed to all on the altar of the Carmelite church. 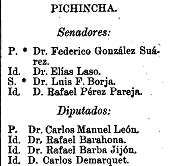 Demarquet remained political chief until 1892 Quito:Colección de leyes y ordenanzas. In 1894, he was a deputy in the legislature Jimenez, Guia de Quito. and vice-president of the municipal council Guia de Quito. He then lived in and owned a house at 45 Pinchincha. probably see the house, or its successor. The site is opposite the right corner of the square when looking towards what is today the street of Sebastián de Benalcázar. The house itself had a history worthy of a Gabriel Marquez novel. Demarquet's wife, Eloisa Bustamante Saenz, had received it as an inheritance from her father Pablo Bustamante del Mazo, whose wife was a daughter of Jose Maria Saenz. They in turn had received it as an inheritance from the general. 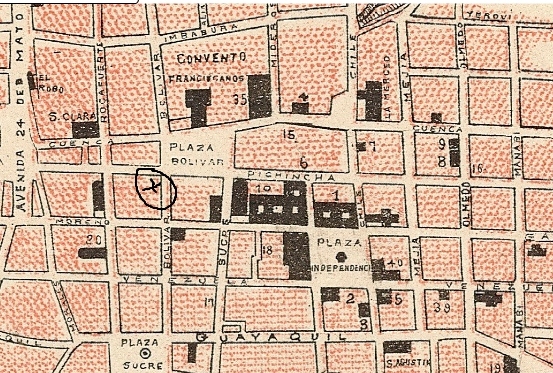 This part of the street was in fact then known as “The street of General Saenz” because the house had been occupied, at the start of the century, by Saenz and his wife, Manuela Demarquet's sister. After all his other perilous adventures, in 1834 Saenz was murdered at Pasillo after having surrendered Pedro Moncayo, Carlos E. Moncayo, Luis F. Veloz, El Ecuador de 1825 a 1875: sus hombres, sus instituciones y sus leyes. Unlike the Marquesa de Solanda, his wife did not hide his body – she kept it, mummified, in their house. Ultimately, it was buried, and in the same convent (the Carmen Bajo) where the Marquesa had hidden her own husband's remains Fernando Jurado Noboa, Calles de Quito, 1989 87-88. Carlos' oldest son Edouardo made an early mark in a very different way. He was still living in his father's house when he helped create the movement of the Chullas. Today “Chulla” is a slang word for a person from Quito, with overtones too of an entertaining lower-class hustler Michael Handelsman, Culture and customs of Ecuador. But it began with a handful of friends who, on a local level, started a movement much as many young people have over the centuries: slightly rebellious, slightly artistic, self-consciously eccentric, exuberantly dressed: “Daily through the city parade trousers with small black and white squares, the green overcoat - moss with chrysanthemum in the buttonhole and leggings the color of a Madrid cuckoo duckling." Fernando Jurado Noboa, El chulla quiteño, 1991 117-121. If they were not dandies, beatniks, hippies or punks, their movement seems to have been a cousin to these. Two men in their thirties, both of good families with modest incomes, started the core group – La Banca Tigre (The Tiger Bank) – in 1884. “They were joined by a group of 12 youths, some students, whose general characteristic was the gift of grace and usually a serious search for alcoholic satisfaction.” Most would remain bachelors all their lives. In 1891, Demarquet was one of the last three to join the group. The group of twenty-one included a number of middle-class members; Demarquet was one of six considered upper class and a landowner. He is also noted as being from the "aristocratic parish of Sagrario". Eduardo Demarquet Bustamante was from the old nobility of Quito at the time, and a grandson of Colonel Demarquet, who was a soldier of Napoleon, and a great-nephew of Manuelita Saenz, he was a cultivated man, admirer and knowledgeable about Sucre. He lived with his parents at the corner of Benalcazar and Bolivar, a few meters away from the plaza de San Francisco, got married at 26, in August 1895 with the guayaquilena Beatriz Morla Jurado - daughter of the famous cocoa baron Dario Morla Mendoza - and died on December 1951 at 82, after living a rather obscure life. At the end of his life he lived at the intersection of the streets Paredes and Rocafuerte. Edouardo had three children: Carlos, Sara and Luz Maria. Carlos, who died at 69 on December 5, 1970, was married to Judith Barba. His obituary says that he did not claim the annuity granted to Demarquet's descendants; there is no evidence that his predecessors did either. 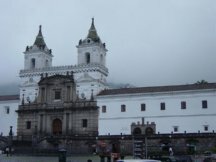 Today, there are numerous Demarquets in South America, most but not all in Ecuador, all it seems descendants of the Edecan's oldest son. These are not his only descendants there. Though his next oldest son Eloi ended his marriage (with Maria Mancheno) without having children, Sofia married her mother's brother, Daniel Fernandez-Salvador. (This was probably less shocking at the time than it might be today – given the close ties among a small group of the better Quiteña families, most people married, at the least, their cousins.) They were married in Paris (on April 14, 1857), which indicates that one or both were living there at the time Marriage certificate (restored summary). He became the first minister of war in the first administration (1859-1865) of Gabriel Moreno. (A tentative reading of the much-eroded family headstone in Paris seems to indicate that Sofia died there on April 7, 1880.) They had three children: Victoriano, who never married, Leoncio, who married Carmen Demarquet, Rosa Maria, who married Manuel Cevallos y Davila (a relative) and had children, and Alicia, who married a certain Mr. Blanchet in France. Boletin de la Sociedad Equatoriana de Estudios Historicos Americanos March-April 1920 IV:298 . Their descendants too are descendants of the Edec�n. One may have been the beautiful Paulina Fernandez-Salvador Demarquet, who, in the 1930's, inspired poets “with her eyes and the shadows beneath them” Fernando Jurado Noboa, Quito secreto. 1998.